These notes are intended to provide a short summary of the best line to take in terms of time and effort. Here’s a PDF file of the notes. along with various downloads for different mapping software. The notes are meant to be read in conjunction with the OS Explorer OL series of maps:- OL4, OL5, OL6 & OL7. However there is a map from the BMC at 1:40,000 scale of the whole Lake District on one sheet. The map is produced in association with Harveys maps. The map is printed on plastic so it is tear resistant and completely waterproof! Someone at the BMC must have known about the Bob Graham Round as, although the main map finishes just to the north of Skiddaw, Great Calva appears on an “insert” on the back. Grid references are in parentheses and are preceded with GR: (GR123456). Summits are not generally given grid references in these notes but are indicated by the geo icon - . Also some spellings may be different to those in common use: particularly the use of the correct “gill” as opposed to the pretentious “ghyll” introduced by Wordsworth and Southey. Bearings are also in parentheses but are preceded by MB-: (MB-256). All bearings are magnetic rather than grid. The magnetic variation is taken as 3 degrees. If anyone has any corrections or additions to make to these notes then please send them in. The notes that appear here depend on the direction chosen in the calculator. By default the notes are for the clockwise direction. There are several points on the round where there are alternative routes. These are shown as a list of options. The exception is the order in which Sergeant Man and High Raise are traversed - this depends on the option chosen in the schedule calculator form. The table below shows expected times for each section for a number of schedules. Leave the Moot Hall and cut through one of the ginnels to the central car park. Cross to the main road and take the road to the left of Keswick Cycles. About 50m along this there is a footpath to the left. This leads to the footbridge over the river Greta. From here go diagonally left across the park and through the wood by the path. At the road turn right and in 100m turn left onto a bridleway. Follow his around Latrigg to join the road to the carpark at (GR-280253). Continue directly towards the summit of Great Calva from the head of the beck via a path through the heather. This bears rightwards as the ground steepens to join the path on the ridge. Bear right along a faint track to gain the main path on the ridge. There is a solitary fence post on the ridge at this point. Follow this to the summit of Great Calva (MB-050). From the south end of the summit plateau follow a bearing of (MB-147) through increasingly high heather to gain the bridleway/track. (Alternative) A couple of hundred metres of very rough ground leads to the River Caldew at around (GR296297) at the big bend in the river. There is a sheepfold on the other bank about 200m from the river (not marked on the OS map). If the river is in spate, then head upstream until the fence crosses the river and use this. Now strike up onto Mungrisedale Common aiming for the cairn marked on the map. The ground is steep at first but eases to provide a steady ascent. You are likely to miss the cairn if your navigation is not accurate. There is a path leading towards Blencathra from the cairn but this fades as the ground begins to rise. Take care not to veer too far to the right, you need to aim for the left end of the summit skyline (MB-117). Just before the ground steepens there is another sheepfold on the left (again not marked on OS map) and the path fades away. About 200m after the fold, bear right finding the best way through the screes, then in the same line to the summit of Blencathra at the top of Hall’s Fell Ridge. Descend this (MB-154), there is some exposed scrambling after a couple of hundred metres. Follow the path down the broader lower slopes before bearing right to the fell gate. This provides a less exposed but longer descent. Preferable if conditions are poor when Hall’s Fell can be time consuming. Head East from the summit and descend on a good path to a small cairn just after the second set of zig-zags. Now follow the path down to the valley and traverse back west to the fell gate. The gully to the west of Hall’s Fell may be descended, but should definitely be recconoitred first as it is not well marked on the ground and the route finding is quite involved. From the fell gate at (GR325263) go straight down the bridleway, past a farmyard, to the minor road, follow this down to the A66. Go out to the valley road, turn left along and after about 100m there is a gate marked “Private” to the right. Go through this into the field and bear leftwards up to where the wall is replaced by a wire fence. There is a stile over the fence. Keeping the beck to the left go straight (or as straight as possible) up the fellside until beneath the final screes. Bear right towards a square boulder and gain a path through the screes and continue rightwards until a small cairn is reached. Now go directly up to the summit of Yewbarrow. Take the well worn path rising on the other side of the col to gain the summit of Red Pike. Continue along the ridge towards Scoat Fell. Do not head towards the summit but keep to the left. This takes you directly to the end of the connecting ridge for Steeple. Go out and back along this ridge. 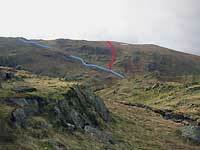 Now follow the old stone wall (leftwards) along the ridge past the top of Scoat Fell. Climb steeply up the rocky shoulder above the pass following a line of old fence posts to gain easier ground on the summit plateau of KirkFell. The summit is around 1/3 of a mile (MB-155), though it is as easy to continue to follow the old fence posts. From the summit head towards KirkFell tarn (MB-050) and pass it on the right to rejoin the main path. Now drop down to Beck Head via Rib End. Keep on a bearing of (MB-085) to take the path up Great Gable's NW ridge. This is all very stoney but it is the last big climb of the round. From the summit of Great Gable descend the steep rocky path to Windy Gap and the short pull up to Green Gable. The going now becomes much easier. From Green Gable follow the wide stoney track that leads down into Gillercombe, but after about 100m bear slightly left on another wide track. This becomes rocky as it drops to the tarns filling the col before Brandreth. The main path swings to the left but continue in a direct line for the summit of Brandreth. This way is grassier and easier going than the path. Continue in a northerly direction, to cross a new fence at a stile. Follow the fence to Grey Knotts. The summit ridge is a rocky whale-back on the Borrowdale side of the fence, it is easiest to run along it than come in from the side. Back across the fence but do not follow it but go straight on before bearing left down a grassy trod. The ground steepens and goes down a spur. At the foot of this spur, head right along a path until a further spur drops down to the quarry road. Go through the buildings to the car park. There is a wire fence leading from behind the youth hostel. Follow this for around 1 Km. Continue up the broad ridge of Dale Head. From the summit of this follow the narrowing rocky ridge (MB-286) that marks the head of Near Tongue Gill, at the narrowest point the path lies on the south side of the ridge. The summit of Hindscarth lies away from the main path so once you reach level ground take a good path leading rightwards to reach it. Take a narrow track that leads down and right from just south of the summit (approximately MB-219 ). This almost joins the main path at LittleDale Edge. At this point keep parallel to the main path until the slopes of Robinson begin to broaden, bear right to reach the summit of Robinson (The last top!!). Take the NE ridge, there are two options: either drop down on the eastern side of this just before a steepening. Follow the path down to Scope Beck, with a steep section just before the valley floor. The track leads along the valley bottom to High Snab (GR221189). Alternatively: keep on the ridge (there is a rock step when level with the dam in the valley) until just before the intake wall it is possible to drop down right to the track. The remainder back to Keswick is on tarmac roads. Go down the farm track, keeping right at the first junction and straight ahead at the second (by a chapel) to (GR231193). Pass through Little Town and continue to Stair. Straight over the cross-roads to the pub at Swinside. A short climb through the woods leads to an undulating descent to Portinscale. Turn right at the chapel in Portinscale and go down the road to cross the river via a footbridge. After a short distance take the footpath on the right across fields then playing fields to enter Keswick close to the museum. Turn right and follow the main road to the bottom of the market square. Take the last climb to the Moot Hall. Well Done!